If you have recently completed Yoga Teacher Training or are RYT 200, but do not yet have teaching experience and would like to gain hands on experience providing non-verbal assists. Yoga Hikes DC is always looking for dynamic individuals to join the team. Yoga Hikes DC is currently recruiting assistants who have great energy, a passion for the outdoors, and are looking to gain experience or learn more about running a yoga business. Athletes, individuals with prior team sport experience, and/or outdoor activity training are highly desirable. Candidates for assisting have signed up and participated in at least one Yoga Hike as a student, completed yoga teacher training, are registered with Yoga Alliance, and carry their own instructor insurance. Are you interested in building your portfolio to reach the yoga community? There is tremendous demand for photographers who can shoot yoga in action. Yoga Hikes DC is always open to finding innovative ways to barter and partner with photographers interested in shooting yoga in action or creating portfolios for individual yogis working with the yoga community. Curious about what we do? 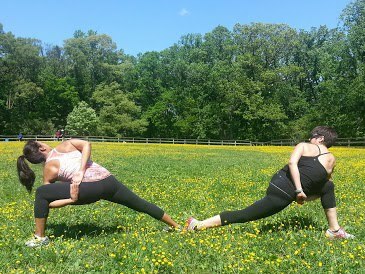 Please check out our photos on Facebook at www.facebook.com/YogaHikesDC. If interested, please email danielle@yogahikesdc.com or call (202) 670-6120.